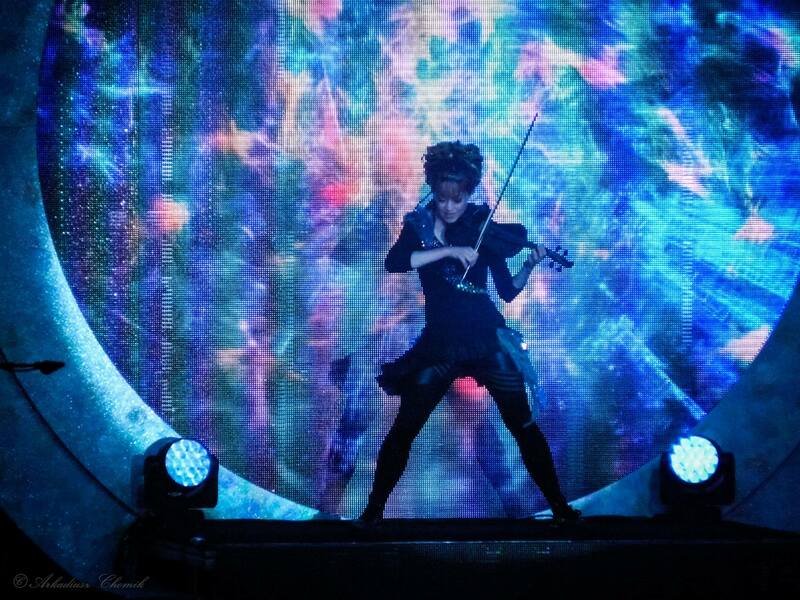 I saw Lindsey Stirling live in Torwar arena in Warsaw. I’ve been to other shows before. I saw U2 on the stadium in Chorzów at their 360 Tour. I saw eight hours long concert of four more or less progressive bands, culminating on a recorded on DVD show by the band Arena. I saw The Legendary Pink Dots twice and Pendragon thrice, including a 30th Anniversary show in Śląski Theathre, also recorded on DVD. Finally, I saw Roger Waters and his The Wall on National Stadium in Warsaw. So, what could a modest, 28-years old violin-playing Mormon girl give me? I mean, besides THE BEST SHOW I’VE EVER BEEN TO IN MY ENTIRE LIFE? I met Lindsey sometime in the beginning of 2014. Someone posted on Facebook a video of two people singing (120 vocal tracks) and playing on violin the music from “Skyrim”. I have no idea why I clicked that – I don’t own, play or never have seen “Skyrim” (someday I will), but the video was of those two – singer Peter Hollens and this cute girl with violin running around the forests and hills, in snow, and even fighting sword vs. fiddlestick. I just had to know who is that girl. Her name was Lindsey Stirling. Then there were other tracks – “Star Wars” and “Game of Thrones” also with Hollens, fantastic “Mission Impossible” with The Piano Guys, and her solo acts, like “Lord of the Rings” and “Assassin’s Creed”. Finally her original tracks from her first album, simply titled “Lindsey Stirling” (which I obviously soon bought), released last year. I learned her story, watched her beginnings in America’s Got Talent in 2010 and then her laborious self-promotion on YouTube. Even if combining violin (with I’m a sucker for) with dance, hip hop and dubstep styles didn’t sell it for me in the beginning, I was charmed by her girl-next-door personality, her smile and interactions with her fans, whose ranks I quickly joined. Her first album needed some time to reach me completely, but now I value not only the most known tracks “Crystallize”, “Transcendence” and “Elements” (of course! ), which are included on the deluxe version of the album also in even better, orchestral versions, but also great are “Moon Trance” (a nod to Michael. J.’s “Thriller”) and “Stars Align” with a video worth watching not for the visual effects, but more for fantastic dancers in it. Her videos are a separate topic – they are all very meticulously directed, shot and edited (often by Lindsey herself! ), full of creative costumes, pictoresque sets and, of course, dancing. Because Lindsey is a dancing violinist. Some say she waves her legs too much, but come on, what else can she wave, if her hands are full of violin? Yes, she may stand in one spot, but the wouldn’t be Lindsey anymore. Vanessa May, maybe. As soon as the tickets for her european tour were out, maybe five minutes later I had mine in my (virtual) hand. In the meantime Lindsey released her second album, “Shatter Me”, along with some videos to some tracks. The opening “Beyond the Veil”, the title track with rocking vocals by Lizzy Hale and epic “Master of Tides”, the video to which you should see, having in mind that it’s not a videoclip, but a flash mob, recorded LIVE! A word about them – A Great Big World are nice young indie rock band who listened to A LOT of Queen. They played six songs (one of The Beatles) and were pretty good. I especially liked “the gayest song ever” that they wrote for their frends from the everyoneisgay.com portal, and which was very well received by the audience, the majority of which was pretty young. Everyone loved that piece of gay propaganda! After they left the stage was cleared of all the instruments and the show itself began… and to my content, it was exactly as I imagined – that narrow stage was such because of the courtain that went down during the first song (“Beyond the Veil”, adequately), uncovering multimedia screens, platforms, more space for Lindsey, her two dancers and two instrumentalists – a drummer and keyboardist. It was fantastic! It was loud and powerful, with verve and energy in dancing and playing. It was lyrical and calm in the accoustic part. It was personal and friendly in the talks between songs. It was funny and ironic during changeovers. It was real and natural with tiny mistakes and improvisations. It was romantic (“All Of Me”), rocking (“Roundtable Rival”), deadly (“Moon Trance”) and cosmic (“Stars Align” for an encore). I’m living this show for a week now and my admiration for that modest little star from the US grew considerably. I can’t wait for her another show, which I already promised myself I’d never miss. PS. In the depths of YouTube I found that show, in the version from San Francisco from May. It’s the same concert, down to the stage, songs and choreography. This is just an ersatz, of course, our was much better, with a lot of tiny nods to Poland and Polish fans (encore was played in polish football t-shirt), but if you weren’t there or on any other show, you can see what you can expect the next time.